Celebrate the rich and sometimes stormy history of the British Broadcasting Corporation and its programming, from the introduction ofradio and television, through WWII and beyond. CBI - China: Day 113 of 142 of the 1st Battle of Hebei. Spain: Day 281 of 985 of the Spanish Civil War. The Madrid Defense Junta is dissolved. Spain: Day 646 of 985 of the Spanish Civil War. CBI - China: Day 291 of 2,987 of the 2nd Sino-Japanese War. Day 76 of 124 of the Battle of Henan. Day 31 of 39 of the Battle of Xuzhou. CBI - China: Day 656 of 2,987 of the 2nd Sino-Japanese War. Day 38 of 54 of the Battle of Nanchang. Day 4 of 35 of the Battle of Suizao. UK: Budget Day in Britain sees the tax increase on beer by 1 penny, whiskey by 9 pence and postage by 1 penny. ETO - Norway: Day 15 of 63 of the Battle of Norway. The British 148th Brigade at Tretten Gorge suffers a heavy artillery barrage in the morning and an attack by light tanks in the early afternoon, so they begin to retreat northward. CBI - China: Day 1,022 of 2,987 of the 2nd Sino-Japanese War. Day 161 of 381 of the Battle of South Guangxi. USA: At the America First Committee meeting in New York City, Charles Lindbergh calls for the United States to stay out of the war. ETO - UK: Day 230 of 258 of the Blitz. German bombers attack Plymouth again. Eastern Front: The German build up for Operation BARBAROSSA continues as 59 divisions are now deployed along the border with the Soviet Union. MTO - Greece: Day 18 of 25 of the Battle of Greece. German paratroopers land on the Aegean Islands while the Luftwaffe sinks 19 more Greek ships. King George II of Greece and his government are flown to Crete by the RAF. Prior to leaving, he instructs that his wine cellar be distributed to the Allied troops defending his country. MTO - Libya: Day 14 of 256 of the Siege of Tobruk. The Luftwaffe bombs the Tobruk Harbor, sinking several ships. MTO - Libya: During the night, the British destroyer HMS JUNO sinks the empty Italian troopship EGEO off the Libyan coast. East Africa: Day 318 of 537 of Italy's East African campaign in the lands south of Egypt. CBI - China: Day 1,387 of 2,987 of the 2nd Sino-Japanese War. CBI - Thailand: Day 205 of 221 of the Franco-Thai War (Vichy France vs Thailand). South Africa: South Africa breaks all diplomatic relations with Vichy France. Atlantic: Day 100 of 169 of Germany's Second "Happy Time," during which U-boats sink 609 Allied ships with little risk. UK: In a secret session of the British House of Commons, Churchill tells them that the liberation of Europe is "the main war plan" of Britain and the United States. ETO - UK: The Luftwaffe begins attacking cathedral cities in Britain. ETO - Germany: The RAF bombs at Rostock. Germany: The German government orders that all boys between the age of 14 and 16 and girls between the age of 16 and 17 are to perform mandatory agricultural service. Russian Front - North: Day 228 of 872 of the Siege of Leningrad. Russian Front - North: Day 75 of 102 of the Battle of the Demyansk Pocket, another failed attempt to break the siege at Leningrad. Russian Front - North: Day 91 of 103 of the Battle of the Kholm Pocket. Another attempt to break the siege at Leningrad. Russian Front - South: Day 176 of 248 of the Siege of Sevastopol, Crimean Peninsula. CBI - Burma: Day 131 of 164 of Japan's Invasion of Burma. Chinese mercenary troops under Allied command attack at Taunggyi. CBI - China: Day 1,752 of 2,987 of the 2nd Sino-Japanese War. PTO - Malaya: Day 64 of 357 of the Battle of Timor Island. PTO - Philippines: Day 137 of 152 of the 1st Battle of the Philippines. Russian Front - North: Day 593 of 872 of the Siege of Leningrad. Russian Front - North: Day 354 of 658 of the Siege of the Kholm Pocket. Russian Front - South: The German 17th Army abandons its attempt to dislodge the Soviet bridgehead at Novorossisk in southern Russia. MTO - Tunisia: Day 158 of 178 of the Battle of Tunisia. RAF and US Air Forces provide Allied air support. The Victoria Cross is posthumously awarded to Lt Wilwood Sandys-Clarke, the only officer still alive after his company is almost wiped out in a counter-attack. Despite his head wounds, he rallies the men and captures three German strong-points before being cut down. CBI - Burma: Day 75 of 79 of the Allied Operation LONGCLOTH. US 10th Air Force provides air support. The Chindits are getting closer to the Chindwin River. CBI - China: Day 2,117 of 2,987 of the 2nd Sino-Japanese War. US 14th Air Force P-40s strafe a 15-truck convoy southwest of Lungling. PTO - Alaska: Day 321 of 435 of the Battle of Kiska, Aleutian Islands. PTO - Gilbert Islands: US 7th Air Force B-24s attack targets at Tarawa. PTO - New Guinea: Day 2 of 148 of the 2nd Battle of Lae-Salamaua. 5th Air Force provides air support. USA: The second incarnation of the Ku Klux Klan officially disbands its national organization over an IRS lien of $640,000 in unpaid taxes, coupled with a membership that had dwindled from over 5,000,000 in the early 1920's to under 10,000. ETO - France: Erwin Rommel writes to Alfred Jodl, noting that if he was given command over the nearby tank formations he could wipe out any Allied landing attempt in France. ETO - France: US 9th Air Force B-26s and A-20s attack V-weapon sites and other targets in the area of Pas de Calais. ETO: US 8th Air Force fighter planes attack airfields and other targets in northern France, Belgium and northwest Germany. Russian Front - North: Day 82 of 191 of the Battle of the Narva Isthmus, Estonia. Both German and Soviet troops remain in their defensive positions. Russian Front - South: Day 16 of 35 of the Battle of the Crimea. Russian Front - South: Day 16 of 60 of the Battle of Romania, 1st Jassy Offensive. MTO - Austria: US 15th Air Force B-17s and B-24s attack aircraft factories and airfields. MTO - Italy: Day 98 of 123 of the Battle of Monte Cassino. RAF and US Air Forces provide air support. The German Gustav Line continues getting weaker. MTO - Italy: Day 93 of 136 of the Battle of Anzio. RAF and US Air Forces provide air support. CBI - Burma: Day 50 of 166 of the UK's Operation THURSDAY. CBI - Burma: Day 45 of 147 of the Battle of Myitkyina. US 10th Air Force provides air support. CBI - Burma: Day 23 of 302 of the Chinese Salween Offensive. US 14th Air Force provides air support. CBI - China: Day 2,483 of 2,987 of the 2nd Sino-Japanese War. Day 7 of 259 of Japan's Operation ICHI-GO. Day 7 of 39 of the Battle of Central Henan, the first offensive in Japan's Operation ICHI-GO. CBI - India: Day 47 of 118 of the Battle of Imphal-Kohima. The Anglo-Indian troops attack the Japanese at Ningthoukhong near Impal. Outside Kohima, the Anglo-Indian troops defending Garrison Hill begin a left hook advance. PTO: US 7th Air Force hits targets in the Caroline and Marshall Islands. PTO - New Guinea: Day 55 of 80 of the Battle of the Admiralty Islands. 5th Air Force provides air support. PTO - New Guinea: Day 218 of 219 of the Battle of Shaggy Ridge. 5th Air Force provides air support. PTO - New Guinea: Day 131 of 597 of the Battle of New Britain. US 13th Air Force provides air support. PTO - New Guinea: Day 2 of 481 of the Battle of Western New Guinea. PTO - Philippines: Day 186 of 299 of the 2nd Battle of the Philippines, aka the Liberation of the Philippines or the Philippines Campaign. PTO - Solomon Islands: Day 175 of 295 of the Battle of the Bougainville Islands. US 13th Air Force provides air support. PTO - Borneo: US Navy PB4Y Privateer bombers use radar guided Bat missiles against Japanese shipping off Balikpapen. This is the first and only time such automatic homing missiles will be used in WWII. 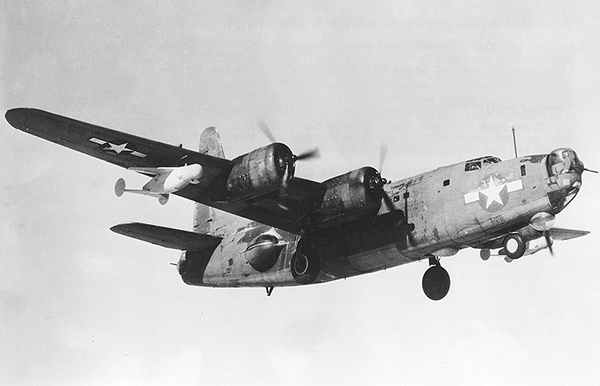 A US Navy ASM-N-2 Bat guided bomb on a Consolidated PB4Y-2 Privateer (a B-24 variant), probably at the Philadelphia Ordnance District, circa 1944-1946. In January 1941 RCA proposed a new TV-guided anti-shipping weapon called Dragon for which an operator would use a TV image sent from the nose of the weapon and operate aerodynamic controls during the weapon's fall. The Pelican was a June 1942 modification to instead drop depth charges (against U-boats) using semi-active radar homing. By mid-1943, the design was changed again to use a new active radar homing system from Western Electric with a 2,000-pound general-purpose bomb. This Pelican version entered testing in summer 1944 at Naval Air Station New York, where it hit its target ship two out of four drops. The Bat was the production version which combined the original National Bureau of Standards airframe with a 1,000-pound GP bomb, the same basic ordnance that was used in the contemporary Azon guided munition, and the Pelican active radar system. The Bat's pioneering radar guidance system was easily confused by radar land clutter, particularly against targets close to shore. However, its development was very instrumental in the emergence decades later of so-called "smart bombs." 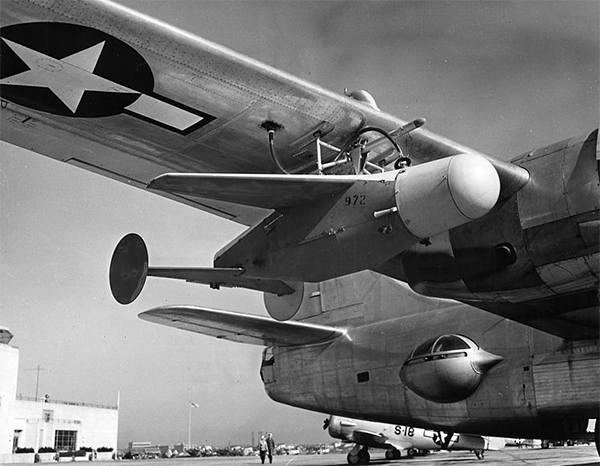 The Bat guided bomb is not to be confused with the experimental "bat bomb" which housed actual live bats, each with a small timed incendiary bomb attached. ETO - France: Day 268 of 284 of the Battle of Brittany. ETO - France: Day 221 of 236 of the Siege of Dunkirk. ETO - Germany: The British 2nd Army reaches the Elbe River near Hamburg. Frankfurt is captured. The RAF bombs Lübeck. Germany: Heinrich Himmler contacts the Western Allies via Swedish Count Folke Bernadotte to negotiate for a peace agreement. Germany: Prisoners of Sachsenhausen and Ravensbruck Concentration Camps begin to be evacuated by German authorities. Russian Front - Finland: Day 221 of 223 of the Lapland War. Finland and Russia have joined forces to kick the Germans out of Finland's most northern province. Russian Front - Center: Day 191 of 206 of the Battle of the Courland Pocket in Latvia. Russian Front - Center: Day 11 of 13 of the Battle of Zemland, East Prussia. Russian Front - Center: Day 8 of 23 of the Battle of Settin-Rostock, both sides of the border between Germany and Poland. Day 2 of the 11-day Battle of Bautzen. Russian Front - Center: Day 8 of 17 of the Battle of Berlin. Russian Front - Center: Day 70 of 83 of the German Siege of Breslau (today Wroclaw, Poland). The Soviets continue with their siege. MTO - Italy: Day 5 of 5 of an assault by the 442nd Infantry Regiment of Nisei Japanese-Americans against German fortifications on the Gothic Line in Tuscany. MTO - Italy: Day 18 of 27 of Operation GRAPESHOT. The US 5th and British 8th Armies reach the Po River north of Bologna. The British 8th Army captures Ferrara while the US 5th Army captures La Spezia. The Allied Air Forces provide air support. CBI - Burma: Day 79 of 99 of the Battle of Pakokku and Irrawaddy River operations in central Burma. The 1st Division of the Indian National Army, an anti-British resistance group aided by the Japanese, surrenders to the Allies at Pyu. CBI - China: Day 2,848 of 2,987 of the 2nd Sino-Japanese War. Day 23 of 91 of the Battle of Zhijiang. US 14th Air Force provides air support. Day 15 of 60 of the Battle of West Hunan (near Zhijiang). CBI - Malaya: The USS BESUGO sinks the German sub U-183 in the Java Sea, only one German sailor survives the sinking. PTO - Formosa: US 5th Air Force attack targets on Formosa. PTO - Japan: Day 23 of 83 of the Battle of Okinawa. PTO - New Guinea: Day 483 of 597 of the Battle of New Britain. US 10th Air Force provides air support. PTO - New Guinea: Day 367 of 481 of the Battle of Western New Guinea. US 10th Air Force provides air support. PTO - Philippines: Day 187 of 299 of the 2nd Battle of the Philippines, aka the Liberation of the Philippines or the Philippines Campaign. PTO - Philippines: Day 130 of 244 of the Battle of Luzon. 5th Air Force provides air support. The Allies capture Cebu Island. PTO - Philippines: Day 45 of 159 of the Battle of Mindanao Island. 5th Air Force provides air support. PTO - Philippines: Day 37 of 135 of the Battle of the Visayas region. US 5th and 7th Air Forces provide air support. A definitive history of US aerial armament in WWII from conventional bombs to some of the most bizarre bombs ever conceived.